I’m finally starting a new quilt. The last actual quilt I made was Kelly’s Baby Quilt 2 months ago. Now I’m using Oh, Fransson’s Mixtape pattern (the Party Mix version, so glad I bought that pattern before it left the shop!) 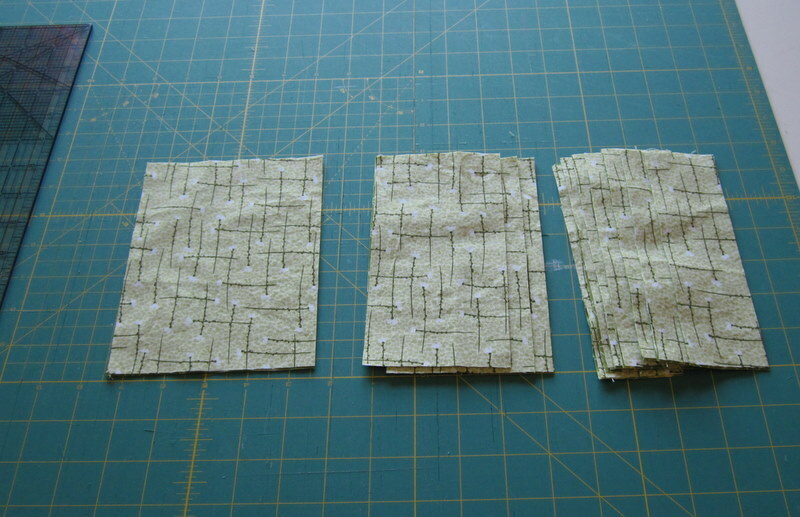 to make what I hope will become…a rug. 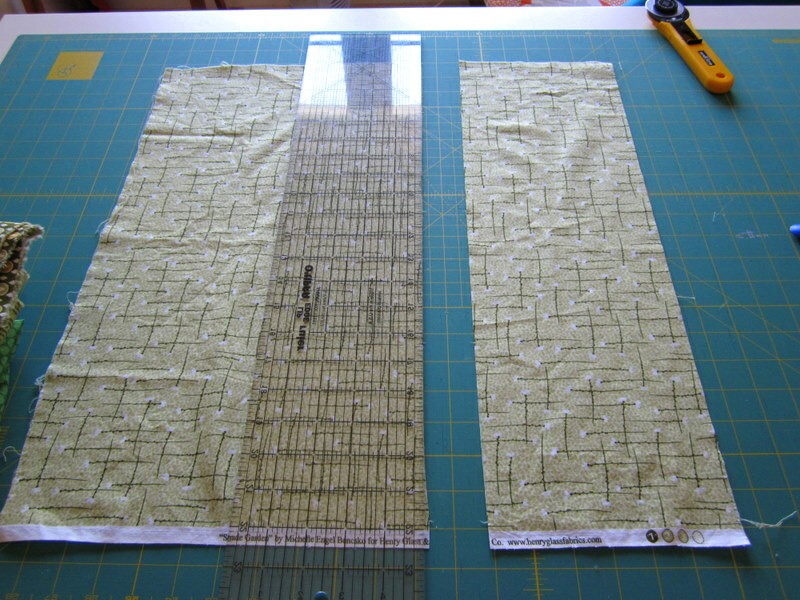 I know it’s completely crazy, but I want to try using a quilt as a rug under the coffee table in the living room. It doesn’t need a giant area rug, and rugs are really expensive, so I thought I’d repurpose a quilt instead. We’ll see how that goes, if I hate it on the floor it may make its onto a wall. The first thing I had to do was decide on a color scheme. I put 4 possibilities together: (clockwise from top left) red, yellow, and black; shades of blue with a caramel brown; shades of green with a chocolate brown; black, white, and grey. 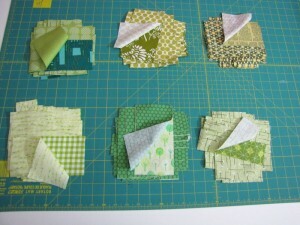 I talked to Adam about his favorite (he’ll be living with it, too, after all), and we both decided we liked the green. I haven’t made much with greens, and it ties the living room into the library. 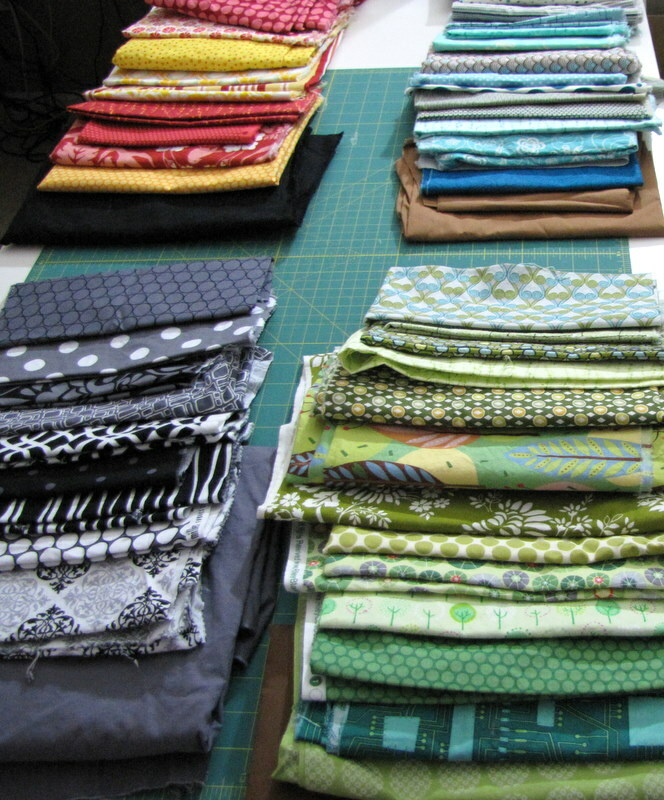 Once I picked the color scheme, I needed to find 12 green fabrics I loved out of a pile of about 15 and pair them off with each other. 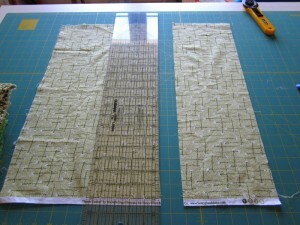 Then I began cutting the fabric. I cut everything down into 3 sizes. 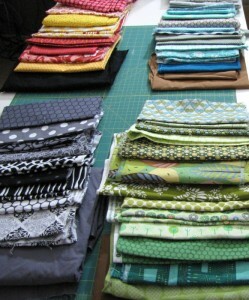 And now I have six pairs of fabrics, all cut into 3 sizes and ready to start sewing into blocks. I have to say, I’m loving this pattern. She gives grids, worksheets for practicing, simple clear directions. It all feels like a checklist, which is something that appeals to me tremendously.